Recently, Blizzard updated their policy in regards to in-game advertising. This is solely pertaining to the services known as WoW carries or boosts, such as weekly mythic +10 or +15. What this means, essentially is that you can no longer start a group design to boost or carry other players, even if it’s for in-game gold. The purpose behind this is to help players actually find groups of other players who want to run the dungeon together, as opposed to having to browse through groups that offer WoW carries. So, in a nutshell, you can now get banned from WoW, or at least suspended, if you’re advertising in-game boosts or carries. To get a better understanding as to what exactly caused this, let’s start going over the feature and the services, one by one. If the name doesn’t ring a bell, then I’m sure you’ll recognize it when you see it. In-game WoW carries or boost is basically the service a group of people offer in exchange for WoW gold, which is perfectly legitimate. What is no longer allowed is advertising it through the LFG system. The most common in-game WoW carries are related to Mythic+. Services such as “your key, our carry” were designed to help players get their weekly Mythic+ (10 or 15) dungeon completed in time, or just their Keystone Master achievement along with the Mage Tower artifact skin. While these services were extremely helpful at the start of Legion, especially the ones offered by top guilds who were farming legendaries and Artifact Power, they became quite a bit of a nuisance later through the expansion. Not only did the actual top players no longer boosted, but whoever chose to do it, was actually asking for real money instead of gold. The WoW carry groups grew more and more, and due to that, you could barely find a group of actual players to do your mythic+ key with. 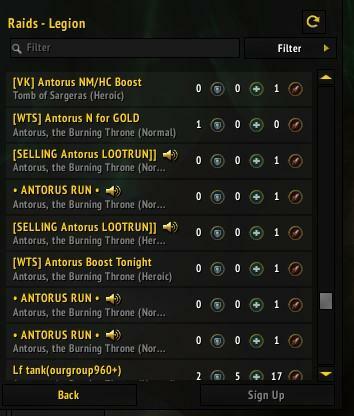 As you can see in the screenshot above, despite there being 9 groups designed to run a Mythic +15 key, only one was a group of actual players, and all the rest were carry runs, for real life money. That being said, it’s understandable why Blizzard chose to put an end to this, as it can really affect your experience as a player if you’re simply trying to find a group to run dungeons with. The same problem was affecting the raiding LFG section, as you can see in the screenshot below. What’s the New Policy Regarding In-Game WoW Carries? As Blizzard puts it, the Group Finder is exactly what its name suggests, meant for finding groups. Because of the carry advertisements, this has proven to become difficult. More so, they’ve also said that more often than not, these groups are a front for real-money transactions (commonly called RMT), which is also a bannable offense, issuing ban waves for both WoW RMT and WoW account sharing). That being said, while the in-game WoW carries for gold can no longer be advertised in LFG, it’s still perfectly within the Terms of Service to advertise them locally, on your realm (such as trade chat). On top of that, I’m sure you’ll be able to find such groups advertised on various forums, Discord groups or reddit, should you need them. 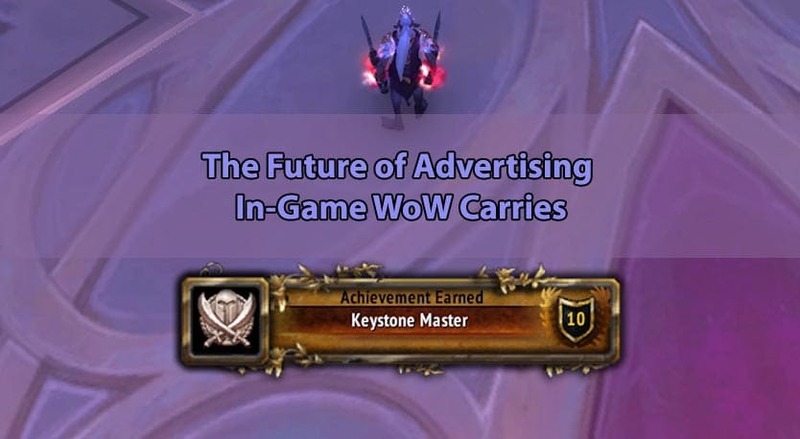 Well, I didn’t think it’ll happen this fast, but now it’s time to also add the WoW LFG carry advertising in our article about the reasons which can get you banned from WoW. 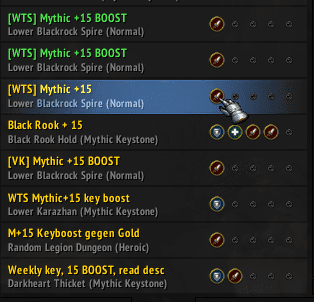 Although I was looking forward to having my alt-chars’ mythic+ key boosted at the start of BfA, for free might I add, since most groups at the start of the expansion are looking for keys to gear themselves up, we’ll now need to keep an eye on trade chat, instead of checking the LFG! Lastly, should you ever find yourself in a position where you got banned from WoW due to advertising your carry group, don’t hesitate to check out our WoW unban service.